Prof. Vesna Zderic (BME) and her collaborators, Dr. Kevin Cleary (Children's National), Dr. Aleksandar Jeremic (Biology), and Dr. Joshua Cohen (Endocrinology), have received a one-year, $50,000 award from Clinical and Translational Science Institute at Children’s National (CTSI-CN) for support of their project, “Novel Ultrasound Device for Treatment of Type 2 Diabetes.” This support comes from the CTSI-CN OPA-II Device Development Award Program. Prof. Samer Hamdar (CEE) and his former student Emily Porter have published a book chapter in the TGF'15 Conference book: E. Porter, S. H. Hamdar, and W. Daamen. (2017). “Pedestrian Dynamics at Transit Stations: An Integrated Pedestrian Flow Modelling Approach,” Traffic and Granular Flow Conference 2015, Springer (Eds: Knoop and Daamen), pp. 361-368. Prof. Lorena Barba (MAE) was an invited participant in the NSF/NIH-sponsored event “Imagining Tomorrow’s University: Rethinking scholarship, education, and institutions for an open, networked era,” held March 8–9 at the University of Illinois at Urbana-Champaign’s National Center for Supercomputing Applications. Participants included university presidents, vice presidents, and vice provosts; representatives from public and private funding agencies; and recognized leaders in open scholarship, data science, computational science, and reproducible research. Prof. Larry Bennett (ECE) has been named an editor for the open access journal Cogent Physics. Master's student Rachael Bevill, advised by Prof. Chung Hyuk Park (BME), has been awarded the 2017-2018 Whitaker International Program Fellowship. The Whitaker Fellowship is a funding opportunity for emerging U.S. leaders in biomedical engineering to build collaborative ties with individuals and institutions overseas. Roughly 30 fellows are selected nationally each year. During the 2017-2018 academic year, Rachael will spend nine months in Stuttgart, Germany conducting research under Dr. Katherine Kuchenbecker, director of the Max Planck Institute for Intelligent Systems, Department of Haptic Intelligence." 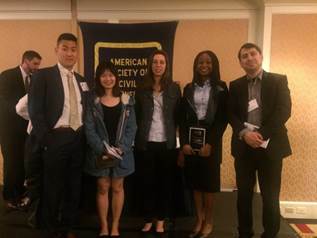 Three GW CEE students won awards at the annual American Society of Civil Engineers (ASCE) National Capital Section (NCS) awards banquet, held March 21 at the Hilton Ballston Hotel. Jiangnan “Louise” Lu and Edna Aguilar each received an ASCE NCS Scholarship Award, and Mojolaoluwa “Demi” Ladipo-Obasa received the Outstanding GW CEE Senior Award. ECE alumnus Faisal Mohd-Yaisin has been promoted to the rank of senior lecturer at Griffith University in Brisbane, Australia. This is the equivalent of a tenured associate professor position in the North American system. Faisal completed both his bachelor’s and master’s degrees at SEAS. Home network attached storage, security system, firewall, and more! Please register or email [email protected] with any questions or comments. The GW Technology Commercialization Office is showcasing promising and impactful GW research with commercial potential. This event provides a forum for idea sharing between GW researchers, entrepreneurs, and members of the venture community. Finalists will pitch their technologies for a chance to win $30,000 in prizes for the development of a prototype or proof-of-concept! All are welcome to attend. Registration for competition entries is now closed. GW’s Research Days Competition is open to all GW faculty, staff, and students. The competition is sponsored by the Office of the Vice President for Research. April 4 will focus on arts, business, education, engineering, humanities, law, mathematics, sciences and other topics. April 5 will focus on health and medicine topics. Shah Selbe is a longstanding believer in the power of engineering and open-source data to solve the world's biggest problems. He has invented cutting-edge surveillance drones and sensors that are saving the environment—on land and in the ocean—from poachers and pollution. MASC-SLL is a one-day event bringing together students, postdocs, faculty and researchers from universities and industry in the mid-Atlantic area. The colloquium is an opportunity for students and postdocs to present preliminary or completed work on computational methods applied to any aspect of computational linguistics. There will be no registration charge and lunch and refreshments will be provided. The submission deadline for abstracts is Friday, March 31.